I am absolutely captivated by the colours, shapes and patterns in this painting. 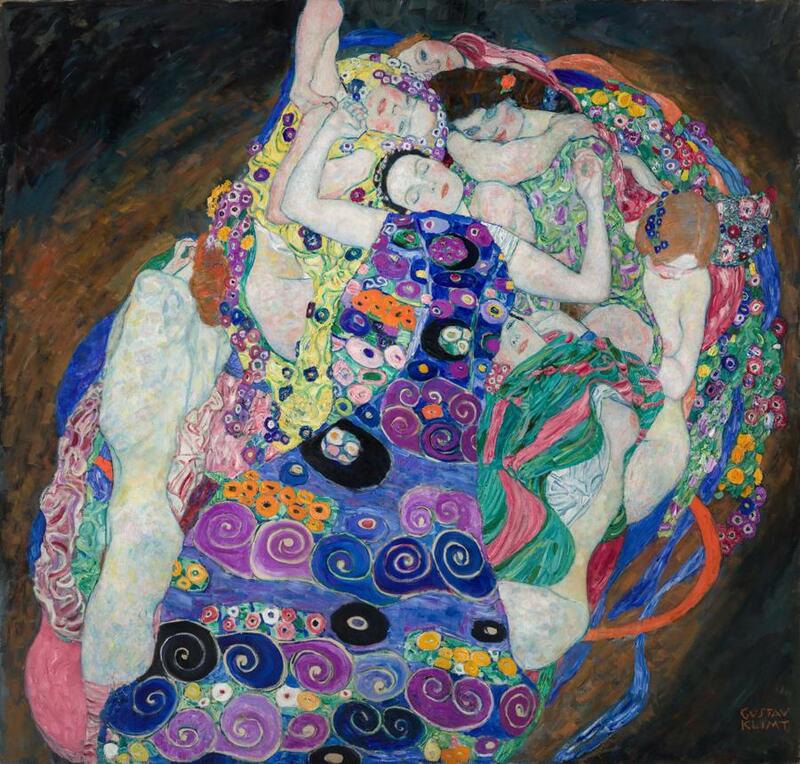 This isn’t Klimt’s “golden phase”, this is his colourful psychedelic phase, and it proved to be his last stylistic change before he died in February 1918. Klimt on acid; borrowing purples and yellows from Matisse and Bonnard, flowers and patterns from Japanese textiles and kimonos, daydreaming of the mosaics of Ravenna. The waterfall of colours is joyfully flickering, laughing, bursting with excitement, dancing and swirling around the pale maidens who are languidly floating in a dreamy kaleidoscopic world of their own; a floating island of love, a resplendent Cythera of their own. The rigor mortis of “The Kiss”, his most famous work and a representative of his golden phase, is now a thing of the past. 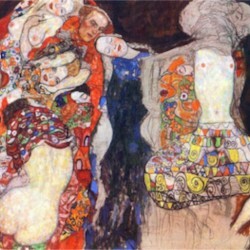 Though the space is still flat and ornamental, it appears far more lively because there’s so much more going on; in a pyramidal composition six female figures are intertwined, their poses and face expressions differ, but they all have the same flesh; their skin is very pale with patches of blue and pink, which brings to mind Schiele’s nudes. Here and there breasts are protruding. They are not as seductive as the femme fatales in his earlier works were, here the colour is what captures all our attention. While the girls all possess similar features and doll-like faces, the pattern appears very unique and well planned. Negating the figure and giving free reign to the pattern might be a step towards abstract art. I would not have awakened. A stylistic and symbolic continuation for the painting “The Virgin” might as well be Klimt’s unfinished work “The Bride” where the maiden figure is at the last step of her virginal life and about to enter a new phase, she is now ripe as a fig at the height of summer, bursting with sweet juices. Again, the close-eyed figure and the swirling pattern and abundance of colours is present. It’s interesting to notice that he painted pubic hair on the figure on the right, and began painting a vibrant dress over it, and I’m sure it wasn’t a sudden change of mind but rather a preference. Yes, it really is bewitching. And inspiring! Always thought Klimt was overrated. I can’t see much psychedelic in his work.If you rip out the figures in the foreground of a lot of Gothic and Renaissance pictures the backgrounds display genuine psychedelic sensibility- the plasticity of the landscapes,perspective is altered- things in the distance are seen just as clearly as close up. Klimt’s pictures have always reminded me of Carlo Crivelli but Crivelli to me is way better – the kaleidoscopic colours,the hallucinatory clarity,the sinister Madonna’s and weird baby Christs.Very cool.